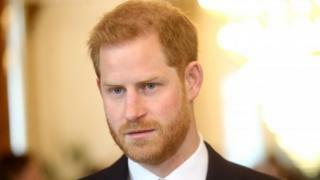 Prince Harry has called for a ban on Fortnite, saying the survival game beloved by teenagers around the world, was "created to addict". The remarks come just before the Gaming Bafta Awards, one of the biggest nights in the UK's gaming calendar, which take place in London on Thursday evening. Of Fortnite, he said: "That game shouldn't be allowed. Where is the benefit of having it in your household? He added that social media was "more addictive than alcohol and drugs". The game has become a global phenomenon and the aim is simple - survive for as long as possible. Each match has a total of 99 other players with the same goals and lasts around 20 minutes, depending on how successful you are. Earlier this month, a GP told an 11-year-old boy that he was "prescribing" a two-week ban from computer games such as Fortnite and Minecraft. Dr Amir Khan said that he was concerned about the impact gaming was having on the boy's life. However, Scottish university researcher Andrew Reid said he thought that the game was not "addictive" and suggested that using the term could stigmatise regular video game players. He added that some research showed "positive characteristics of play". "My grades were slipping as a result of playing too many games. I didn't eat, sleep or leave my room. I escaped my problems via games," he recently told a group of MPs. "Games fire up response systems in your brain and other things don't bring you as much joy," he told the MPs. "I was thinking, 'Why would I spend time with my friends when I can play video games?'. "It felt good to get points, trophies, beat people. It fuelled my competitiveness - but I realised I wasn't truly happy." "I was getting headaches, moods and I had to lock my computer in a cupboard," he said. What's the view of the games firms? Gaming is booming and the UK games industry is worth a record £5.7bn, in part thanks to Fortnite, according to new figures from gaming trades body Ukie, which said that there was "little evidence" gaming causes harm to health. Dr Jo Twist, Ukie's chief executive and chairwoman of Bafta Games, said: "We care about players. "We want to help parents and carers who don't play games themselves to feel better equipped and knowledgeable about safe and responsible game play, and the positive impact games can have on people's lives." She added that game age ratings "should be taken seriously" and that parents and carers should use online resources to ensure their children played in a responsible way. He told the BBC: Large scale research studies on the topic indicate that games may not be inherently addictive and should best be thought of as a coping mechanism for, rather than cause of, mental distress. Placing undue blame on games risks stigmatising a popular hobby regularly pursued by nearly two billion people." It is due to report back on its findings later this year. Chairman Damian Collins told the BBC ahead of that: "We have invited Epic Games, the company behind Fortnite, to give evidence to our investigation, which is examining the addictive nature of gaming, as well as links between gaming and gambling. "We hope that Epic will accept our invitation. We will certainly raise with them the significant concerns that Prince Harry has expressed about Fortnite, and how they respond to his call for it to be banned." And it is not just the UK that is looking into the links between gaming and the health of youngsters. China, the world's largest gaming market, is increasingly concerned about addiction and the impact of gaming on children's eyesight, and has taken strong measures to crack down on the issue. China's tech giant Tencent has tightened checks on the age of people playing online games - checking identities and ages against a police database.